Cancer patient John Krahne has delayed taking a prescribed cancer drug because it was too expensive. He walks near his home in Santa Rosa, Calif.
Krahne, here with his wife, Audrey, says that delaying cancer treatment because of its cost "was an educated risk that we didn't take lightly." For the first time since being diagnosed 10 years ago, Krahne, 65, decided to delay filling his prescription, hoping that his cancer wouldn't take advantage of the lapse and wreak further havoc on his body. 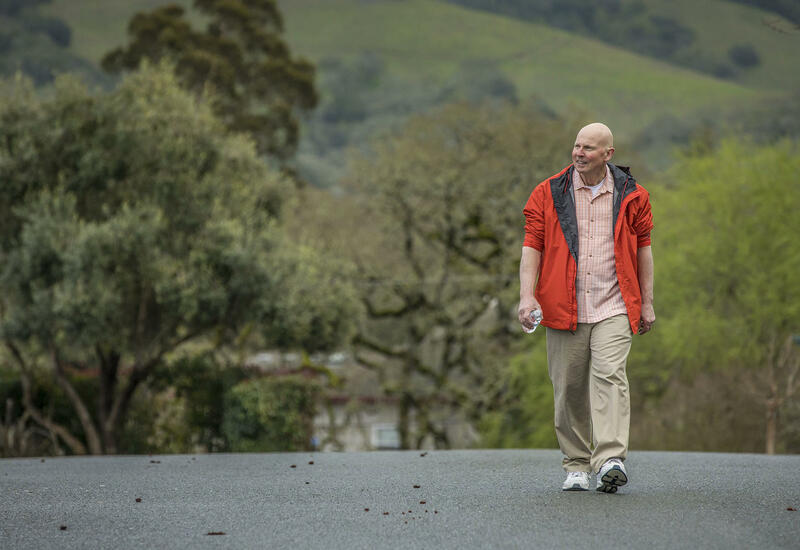 With new cancer drugs commonly priced at $100,000 a year or more, Krahne's story is becoming increasingly common. Hundreds of thousands of cancer patients are delaying care, cutting their pills in half or skipping drug treatment entirely, a Kaiser Health News examination shows. One-quarter of all cancer patients chose not to fill a prescription due to cost, according to a 2013 study in The Oncologist. And about 20 percent filled only part of a prescription or took less than the prescribed amount. Given that more than 1.6 million Americans are likely to be diagnosed with cancer this year, that suggests 168,000 to 405,000 ration their own prescription use. "Patients are being harmed daily" by high treatment costs, says Dr. Hagop Kantarjian, a leukemia specialist and professor at Houston's MD Anderson Cancer Center. "It's causing more deaths than necessary." For instance, one-third of Medicare patients who were expected to use Gleevec — a lifesaving leukemia medication that costs up to $146,000 a year — failed to fill prescriptions within six months of diagnosis, according to a December study in the Journal of Clinical Oncology. Stopping drugs like Gleevec could be cutting years from some patients' lives. Instead of dying in five to seven years, patients with chronic myeloid leukemia who take Gleevec and similar drugs can survive nearly as long as people without cancer, and with a good quality of life, Kantarjian said. 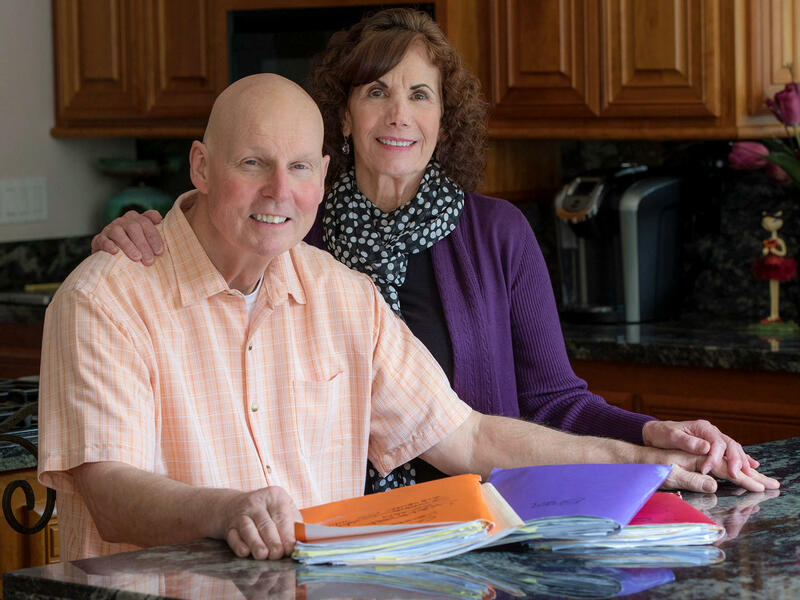 Given that his lung cancer has grown slowly over the years, Krahne's doctor thought it would be safe to wait until January to begin his new medication. "We hope it doesn't hurt my chance of cure," says Krahne, from Santa Rosa, Calif. "It was an educated risk that we didn't take lightly." Krahne made repeated calls to patient-assistance programs throughout January, trying to find help with his out-of-pocket costs. "The anxiety during those days or weeks was probably almost as bad as the day I was diagnosed with cancer," Krahne says. Doctors have a term for Krahne's problem: "financial toxicity." "We're talking about huge numbers of patients," says Dr. Scott Ramsey, director of the Hutchinson Institute for Cancer Outcomes Research at the Fred Hutchinson Cancer Center in Seattle. "It's an epidemic. And it's not going away." Even patients with good insurance can face a financial crisis when trying to pay for cancer therapy. Medicare pays for the bulk of cancer care in the United States because 59 percent of cancer patients are older than 65. And although it covers a high percentage of the cost, copays for patients such as Krahne can easily reach $10,000 a year, according to Stacie Dusetzina, a researcher at the University of North Carolina who has found that privately insured patients with copays of just $53 were 70 percent more likely to stop taking Gleevec or take fewer doses than prescribed. Unlike many commercial private plans, Medicare doesn't set an upper limit on what patients pay out-of-pocket. Patients with chronic lymphocytic leukemia who begin oral medications this year, for example, can expect to have lifetime out-of-pocket costs of $57,000, according to a January study published in the Journal of Clinical Oncology. High drug costs are a particular problem for the elderly, half of whom have $13,800 or less in available assets, and many have more than one expensive chronic condition, such as heart disease, diabetes or emphysema. The median income for people on Medicare was $24,150 in 2014, according to the Kaiser Family Foundation. Medicare patients with cancer spend an average of 11 percent of their income on treatment, according to a November study in JAMA Oncology. Patients who don't have supplemental insurance, which pays for treatment not covered by traditional Medicare, spend 23 percent of their income on cancer care. Ten percent of elderly patients without supplemental insurance spent 60 percent of their income on cancer expenses. In John Krahne's case, persistence finally paid off. After making repeated calls to patient-assistance programs in January, Alecensa's manufacturer, Genentech, agreed to help pay Krahne's out-of-pocket costs. He began taking the drug Jan. 27, six weeks after it was first prescribed. It's impossible to know whether Krahne's health will be affected by the delay, said Ramsey. "Most oncologists are OK with delays of up to a month, but after that they start getting anxious that further delays will harm chances for survival," Ramsey says. When thinking about having to find the money for more than $10,000 in cancer treatment a year, Krahne says: "Hopefully, I won't have to do this year after year." Yet Krahne acknowledged that paying high prices is the cost of surviving cancer today. "So, hopefully, I will have to do this year after year." List prices for oral cancer drugs doubled from 2011 to 2016, rising from an average of $20 for a day's supply to $40, according to Express Scripts, a pharmacy benefit manager. Six of the 39 cancer drugs on the market in 2010 doubled or tripled in price by 2016; one quadrupled in price; one drug's price increased eightfold. Treating melanoma patients with Keytruda, an immune therapy that has led to long-term remissions in some patients, including former President Jimmy Carter, costs $152,400 a year. Such costs are leading to soul-searching by doctors, who often struggle to help patients decide whether drugs are worth the consequence of depleting their life savings, or going into debt or even bankruptcy. "My job is to prescribe the best treatment," says Dr. Yousuf Zafar, associate professor of medicine and public policy at the Duke Cancer Institute in North Carolina. "But I'm not doing my job if I prescribe a drug and walk away and leave them with tens of thousands of dollars in immediate debt." In a statement, the Pharmaceutical Research and Manufacturers of America, an industry group, noted that drug costs are only one part of the problem. "Many factors contribute to financial hardship for cancer patients ... physician services, transportation expenses, and the inability to work, among other medical and non-medical factors, drive the cost burden on patients. We have also seen a rapid rise in the number of health plans with high deductibles for medicines." And officials at Gleevec's manufacturer, Novartis, noted that the company provided financial aid to 130,000 patients last year, including those struggling to pay for Gleevec. "We price our medicines to reflect the value they bring to patients and society," says Novartis spokesman Eric Althoff. "We also continue to invest in new treatments so that we can find ways to make more cancers survivable." Liza Bernstein, 52, was diagnosed with breast cancer three times from 1994 to 2009. She emptied her savings account after her second diagnosis and gave up her apartment because she couldn't pay her rent. Bernstein sold some belongings and put the rest in storage, where they remain. She has been living with friends and relatives ever since. "People say 'Call this foundation or that foundation,' " for help, says Bernstein, a freelance designer and patient advocate in Los Angeles who was unable to work for several years due to her illness. People don't understand "the cognitive and emotional exhaustion of trying to manage this and wrap your brain around everything you need to do." Cancer often limits patients' ability to hold down a job. Four years after diagnosis, one-third of previously employed breast cancer survivors were unemployed, according to a 2014 study. Patients who lose a job don't just lose a paycheck; they often lose their health insurance. In a 2012 study of 284 colorectal cancer patients, 38 percent reported one or more financial hardships as a result of treatment, such as being forced to sell or refinance their home or losing more than 20 percent of their income, even though nearly everyone in the study was insured. Seventeen percent borrowed money from family or friends, at an average of more than $14,000. Twenty-three percent were in debt 20 months after their diagnosis, with an average debt of $26,860, according to the study. Even patients without severe hardship saw their fortunes change due to cancer, as they sold stocks and drew on savings. About 3 percent of patients with cancer declare bankruptcy, says Ramsey, whose 2013 study found cancer patients are 2.7 times more likely to file for bankruptcy than those who've never been diagnosed. Although Bernstein considered declaring bankruptcy, she said she couldn't afford the $500 to $600 it would have cost for a lawyer and filing fees. And bankruptcy isn't just financially devastating. Mortality rates among cancer patients who filed for bankruptcy are, on average, 79 percent higher than those of other patients, according to Ramsey's 2016 study in the Journal of Clinical Oncology. Bankruptcy is associated with an especially high risk of death for certain cancers. For example, mortality rates are 2.5 times higher among patients with colorectal cancer who filed for bankruptcy compared with patients who didn't file. Financially stressed patients may skip pain medications and miss doctor's appointments. And those who skip taking drugs to relieve nausea and vomiting, Ramsey said, can die from dehydration. Finding oneself in "a place of need"
Some patients "have to choose between paying their meds and heating their home," says Carla Tardif, chief executive officer at Family Reach, a New Jersey charity that provides financial aid to families dealing with cancer. "I went into a home and there were two sleeping bags on the kitchen floor. The mom said, 'We sleep by the stove because I can't afford the heat.' "
Molly MacDonald, who was diagnosed with breast cancer at age 54, when she was a divorced single mother of five, opted not to undergo reconstructive surgery because of the cost. She worried about the increased risk of infection and hospitalization, which she knew she could not afford. "All of my decisions were based on cost," says MacDonald, of Beverly Hills, Mich. "We sold things. I cut the kids' hair myself. Friends brought food. Then I found myself in line at the food bank. I used to have groceries delivered. It was interesting to find out how quickly someone can find themselves in a place of need." In October 2006, after MacDonald got back on her feet, she began soliciting donations for a nonprofit she created called The Pink Fund, which helps to pay breast cancer patients' bills. The fund now pays about $65,000 in bills a month. "We've helped people who are living in storage units, living with their families, living in cars." MacDonald often draws from her experience when offering financial advice. Consider selling your house to prevent it from being taken away, she suggests. Remember that as bad as the situation is, it's not permanent. But she also asks clients, "What in your house can you sell?"